Twin-helm in wheelhouse and flybridge. Single lever morse engine control in both wheelhouse and Flybridge. Spacious engine room, ideal for additional generator or tanks. Economical 10.5 ltr/hr at cruising 9.75 knots. 50 gallon reserve fuel tank. Dinette converts to a double-berth. Flavell Vanessa Cooker with Grill & Oven. Two Blakes Lavac Heads, one with shower. Raymarine Pathfinder RL70 Combined Radar & Plotter with west coast of Scotland charting. Garmin 551L Sounder / Fish-Finder. The famous Rampart Boat Building Works is highly regarded by many and produced some of the finest motor-cruisers ever made. This is a late-model 39 from 1978 which has a custom built flybridge with a second helm and a re-designed radar mast. She is well maintained by her current owners and her accommodation is both spacious and comfortable and just requires some tlc. 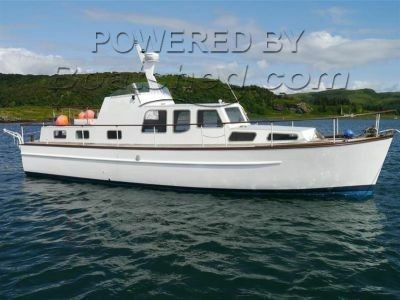 With lots polished wood, that gives a give a warm inviting feel, she would be an ideal boat for long-term cruising or as a very comfortable liveaboard on canals and inland waterways.She would also lend herself to commercial liesure use. This Rampart 39 - Traditional Flybridge Cruiser has been personally photographed and viewed by Ian Sawkins of Boatshed Scotland. Click here for contact details.